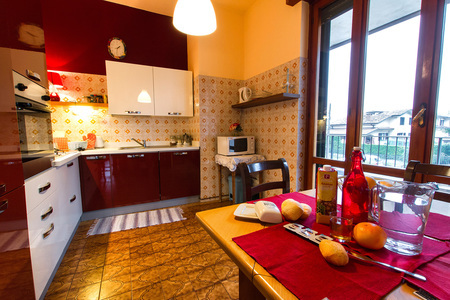 Enjoy year-round home comfort; with this authentic 2 bed villa apartment for 5! 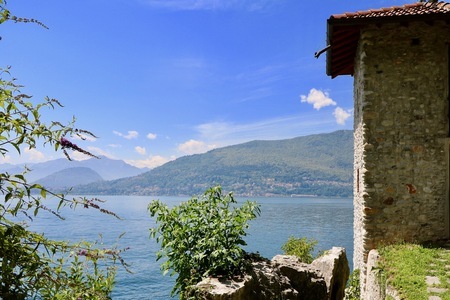 Situated in a private villa residence, this bright and spacious 1st floor home provides a serene setting for carefree Lake Maggiore breaks. 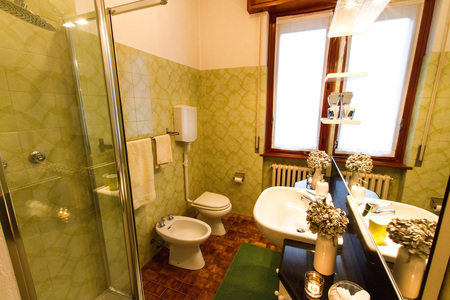 Perfect for dipping into the town amenities of Monvalle and the local highlights of the eastern shore (with the Santa Caterina del Sasso Hermitage, Angera Castle and Laveno’s resort amenities and ferry links all within 16 minutes’ drive away), the location serves as a great base from which to explore. Inside, the WIFI-enabled holiday home offers plenty of space in which to relax, socialise and entertain. The generous living room boasts plenty of natural light, thanks to its triple aspect views. The stylish room is also furnished with home comfort in mind; with a cream sofa and corner sofa accompanied by a table with 4 pouf chairs and a flat screen TV. French doors from the room also lead out onto a covered private balcony terrace, which is perfect for alfresco entertaining and carefree sunbathing. 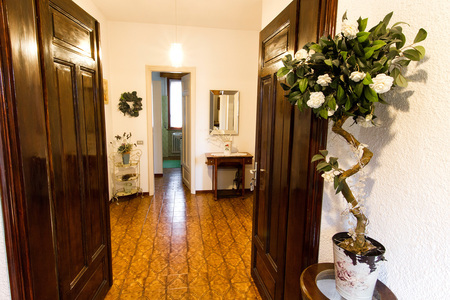 A lovely private garden also awaits your enjoyment. A separate family Kitchen Diner offers a charming venue for relaxed meals and pre-dinner party moments. The outside dining area also invites guests to savour summertime meals out in the sun and under the stars. 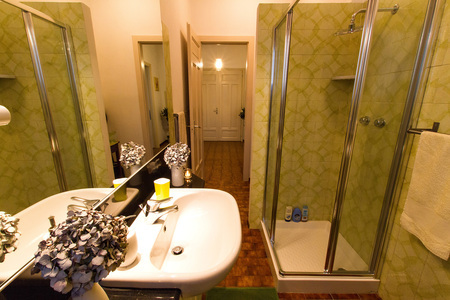 The apartment benefits from 2 spacious bedrooms, 1 shower room and 1 family bathroom. The master bedroom with double bed is perfectly-suited for a couple, whilst the 2nd bedroom with double bed and single bed provides a versatile family room for 3. Upon request, grown-up guests can also enjoy the private billiards room as well as the convenience of private laundry facilities and a private parking space. 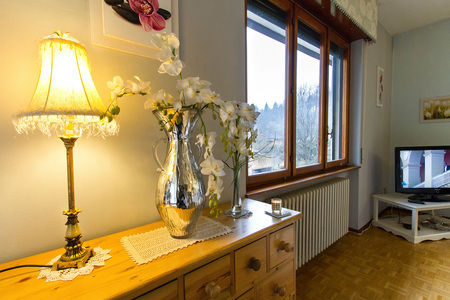 The owners will also consider pets too; so, what are you waiting for! Monvalle is home to a handful of eateries and ‘Ristorantes’ and the beautiful partial-sand partial-garden beach of Monvalle, just 1km away from the house. The town’s convenient road links lead in no time to the Golfo della Quassa Park, the well-serviced town of Ispra, the ferry links and resort amenities of Laveno (all within a 10-16 minutes’ drive away) and the local tourist attractions of Santa Caterina del Sasso and pretty family-friendly lake beach of Reno (7 minutes’ drive), and the wonderful Angera Castle (13 minutes’ drive). 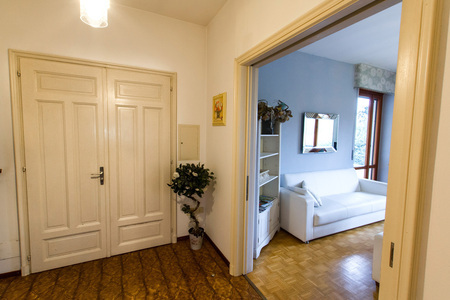 The town is also well placed for reaching the western shore tourist attractions, by way of taking the nearby Laveno car-passenger ferry across to Intra. 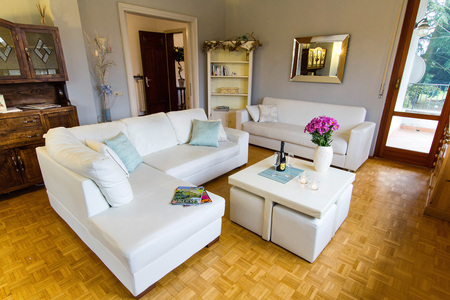 From here, Villa Taranto with its botanical gardens, the child-friendly zoo of Villa Pallavicino, the hiking opportunities of Mottarone, the beautiful lake promenade in Stresa and the frequent boat tours to the Borromeo’s islands can all easily be reached. 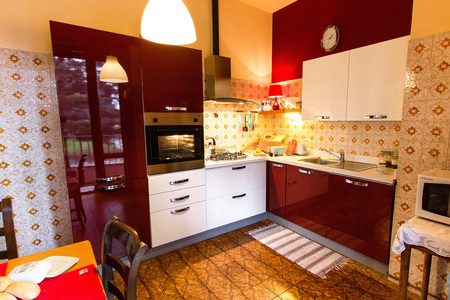 Milan Malpensa airport is situated just 42 minutes’ drive from the property. Relaxing Open Plan Living room • A bright and stylish triple aspect living space with access to two private terraces (the larger of which features an electric awning and is perfect for all-day dining) • Furnished with a cream fabric sofa, a 2nd cream L-shaped sofa, a table with 4 pouf seats and a flat screen TV • Complemented by free WIFI access Eating In Separate Kitchen Diner • A fully-equipped family Kitchen, perfect for informal breakfasts together • Fitted with glossy cabinets, a cooker hob, oven, microwave, electric kettle, coffee machine, toaster and dishwasher • Furnished with a breakfast table for 4 • Offers balcony access Sleeping The villa apartment offers 2 bedrooms and 2 bathrooms; making it perfect for 2 couples looking to stay. 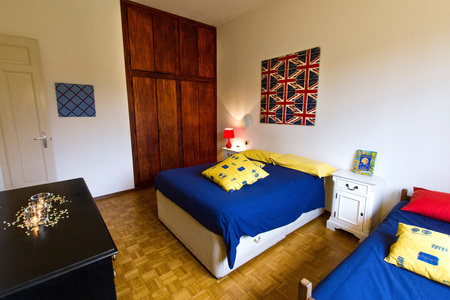 The flexible sleeping arrangements will also appeal for family groups of 5. Bedroom 1 • A bright and welcoming room • Furnished with a Double bed and wardrobe Bedroom 2 • A versatile family bedroom, perfect for 1 couple or group of 3 • Features a Double bed, a single bed and a fitted wardrobe Upon request, travel baby cots, high chairs and single adult camp beds can also be hired. 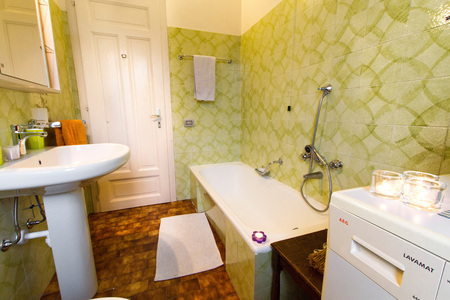 Bathing Bathroom 1 • A spacious retro-style suite, fitted with a bath tub, wash basin, WC and bidet Bathroom 2 • A spacious bathroom fitted with a power shower, wash basin, WC and bidet Outside French doors from the living room lead out to a lovely covered private balcony terrace. Furnished with an alfresco dining set, the sunny setting serves as an idyllic spot for relaxing and catching up with loved ones and friends. Additional • 1st floor villa apartment, set in a peaceful and authentic location • Features WIFI access (at a small fee), a flat screen TV and a billiards room • Flexible sleeping arrangements to suit 4-5 • Separate fully-equipped kitchen • Washing machine and ironing facilities • Hairdryer provided • Alfresco dining terrace • Features 10 external steps • Features 2 sun loungers • Pets possible Parking The apartment offers a private parking space. 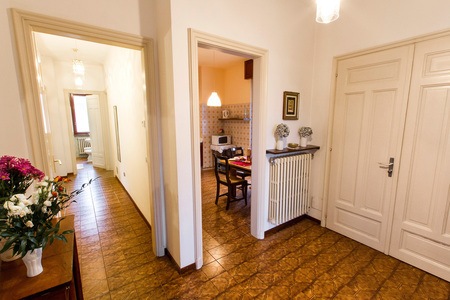 Location From its peaceful villa setting, guests are within 4 -minutes’ drive from the local ‘Ristorante Antico Lido’ and the local ‘Spiaggia di Arolo’ lake beach. Monvalle is situated along the gorgeous eastern shore; where the restaurants and sport clubs of Ispra, the resort highlights and ferry links of Laveno, the UNESCO ‘Santa Caterina del Sasso’ Hermitage of Reno, the ancient ‘Rocca di Angera’ castle in Angera (7-16 minutes’ drive away). 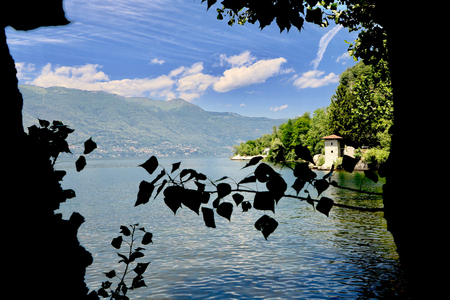 The Laveno ferry links also make it easy for enjoying the local western shore highlights of Stresa, the boat tours Borromean Islands, the gardens of Villa Taranto, the scenic ride up on the Mottarone cable car, the beautiful Villa Pallavicino and the gorgeous Botanical Alpine Garden. 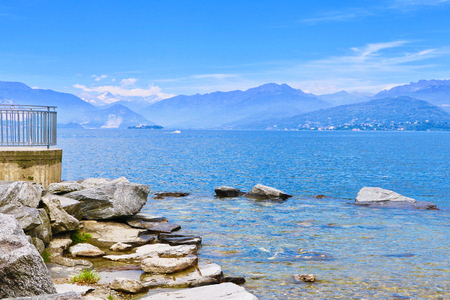 With golf clubs, hiking routes, wildlife parks, lidos and Ski resorts all within easy driving distance, Lake Maggiore truly offers something for everyone! 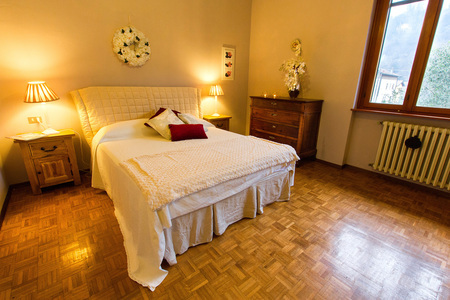 Easily accessible for year-round stays; the apartment is situated just 42 minutes’ drive from Milan Malpensa airport. July 2018 Very luxurious apartment. we enjoyed our stay in summer 2018 very much. also a good starting point to discover the lago by car or by boat (Navigazione Laghi: Santa Catarina) Roberto, UK " Roberto "